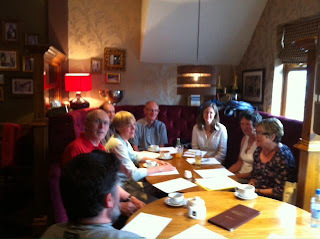 30 May 2012: The West Bridgford Transition group had an AGM and 4th birthday party at Belle and Jerome on 30 May. There's a more detailed summary on the WB-Transition website and on the Facebook page. I hope we can add a more detailed record when the group scribe has written it. A couple of weeks ago, we had the Summer Gathering and several people signed up at the Transition stand to visit three houses, Peveril, Harms and Holt house, as examples of eco-retrofit insulation and/or technology. The Transition movement addresses many different aspects of transition into the low energy future. Lifestyle, transport, gardening, localism, energy efficiency are all examples of this. I am involved because it's a central ethos driving me to do this research on the Peveril Solar house. More people turned up after this photo was taken. Thankyou Belle and Jerome for the upstairs room.